A trust is a legal instrument that allows a trust owner to maintain full control of his assets both before and after death. A trust outlines the owner’s wishes for how trust investments are handled and how assets, such as money, property and real estate, are distributed upon his death. The trust owner names a successor trustee to carry out these mandates. Protesting the terms of a trust can be a challenging undertaking because a trust is not subject to probate like a will and the estate is often settled in an expedient manner. A protest can be made by a named beneficiary of a trust or an individual who believes he should be a named beneficiary of the trust. An example is an estranged child who feels he was slighted in his presumed inheritance. The successor trustee, who is the individual the original trust owner designates as the person legally responsible for carrying out the instructions outlined in the trust, is the first person who should be notified of a trust protest. While the successor trustee cannot make changes to the trust, he may be able to provide an explanation for why certain provisions exist and resolve the issue before legal action is necessary. If no resolution is possible, he may be able to direct you or your legal representative to the trust owner’s attorney who originally created the trust. 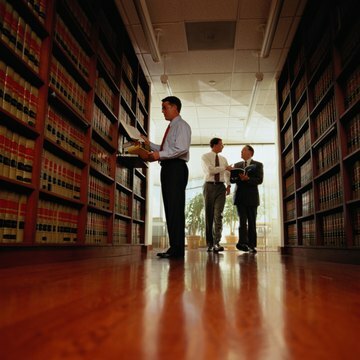 This individual can provide clarification of the terms of the trust as they are governed by that particular state's law. To move a protest forward, you may wish to consult a legal professional for advice. Trusts are difficult to protest because they are typically established and maintained by the original individual for the purpose of having complete legal and financial control over personal assets. Because trusts are not subject to probate, they are settled quickly. A legal professional can help you understand if you have a case substantial enough to warrant individually suing beneficiaries of the trust, which is the only course of action available once a trust has been settled. It is not enough to claim you are upset a relative didn't leave you as much money as he left other relatives or an inheritance was not divided equally, in your opinion. Grounds for protest must be legal in nature. For example, if a trust bequeaths property to an individual and you have documentation that the property rightfully belongs to you, this gives you legal standing to protest the trust. Another way to contest the validity of a trust is to show the owner of the trust was mentally incapacitated at the time the trust was created. To make your case, you need supporting evidence from health care providers who can provide details about the original trustee’s health and mental state during the time the trust was created or updated. While you may enlist the assistance of friends or family members of the trust owner to speak to his state of mind, it is unlikely it will have an impact on the legitimacy of the claim if it is not documented by a health care provider who was treating the owner at the time the trust was created. Understand that a living trust can contain something called a “no contest clause” which states that if the validity of the trust is challenged by a beneficiary, that person is automatically excluded from receiving proceeds from the trust. For example, if you protest that a sibling received a larger inheritance than you and the trust contains a no contest clause, you could legally forfeit your claim to any inheritance at all. A legal representative can help you better understand the terms and conditions of the trust you are considering protesting before moving forward with legal action. You create a living trust to transfer assets to the control of a trustee, who has the legal authority to manage the assets and distribute them to your named beneficiaries according to your instructions. A revocable trust is one that you may legally amend at any time with the use of a simple amendment.